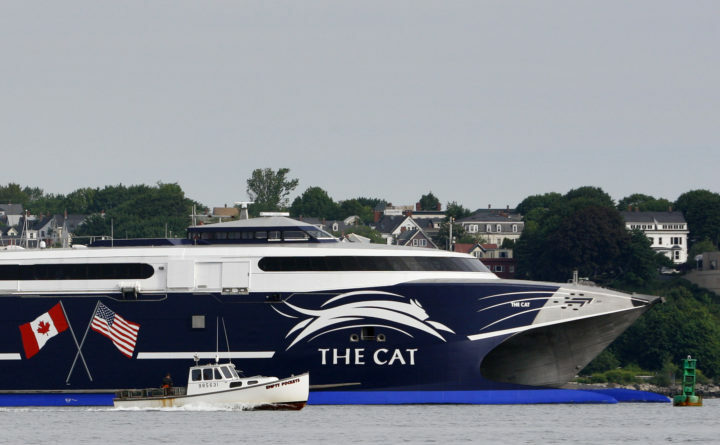 The high-speed Cat ferry leaves Portland Harbor in June 2009, bound for Yarmouth, Nova Scotia. BAR HARBOR — The town will lease its former ferry terminal to a company that decided to abandon the property nearly 10 years ago. The Town Council voted 7-0 on Tuesday night to allow Town Manager Cornell Knight to sign a five-year lease agreement with Atlantic Fleet Services, the Bar Harbor-based agent for Canadian former terminal owner Bay Ferries Ltd.
Bay Ferries operates The CAT, a high-speed catamaran ferry that runs between Maine and Nova Scotia. As part of the deal, the company would move its U.S. operations from Portland to Bar Harbor, where it operated for 53 years before finally closing in 2011. The company decided in December 2009 to cease operating from Bar Harbor, citing loss of subsidies from the Nova Scotia provincial government, but continued to run The CAT for a few more months. The deal likely will be signed within two months, as it has conditions that include finishing site designs and acquiring permits. Bay Ferries hopes to launch the ferry service at 121 Eden St. in June. Several residents protested the deal as rushed. “The financials with a marina and a park have not been looked at,” O’Connell added. Councilors said the Bay Ferries lease was the best path to creating a marina on the property. The lease includes Bay Ferries’ spending $3 million in infrastructure improvements to the idle Route 3 property and paying the town at least $200,000 in annual rent. “I don’t see a downside,” Councilor Judie Noonan said of the Bay Ferries deal. “If we can have income on that site for the next five years, I think we as a council owe it to the taxpayers to seriously consider it,” Councilor Matthew Hochman said. Without the Bay Ferries deal, councilors said they see no way to pay the terminal property’s $3.5 million price without raising taxes. Town residents voted to buy the terminal in June. The closing on that purchase is set for Nov. 30, Noonan said. The marina could be developed alongside Bay Ferries’ leased portion of the terminal, which would lie fallow for years without the company’s investment, Hochman said. It will likely take five to seven years to create a marina there, Noonan said.